Mexico’s Copper Canyon often garners comparisons to the Grand Canyon, but it is unique in a number of ways. For starters, Copper Canyon is a group of six canyons, and parts of it are deeper than the Grand Canyon. The brilliantly colored canyon walls (copper and green) are where the name originates. Copper Canyon is also home to the Tarahumara people, who are famous for their long-distance running. The wildlife and plants are drastically different from the Grand Canyon as well. Travel during or just after the rainy season to see lush greenery and wildflowers. 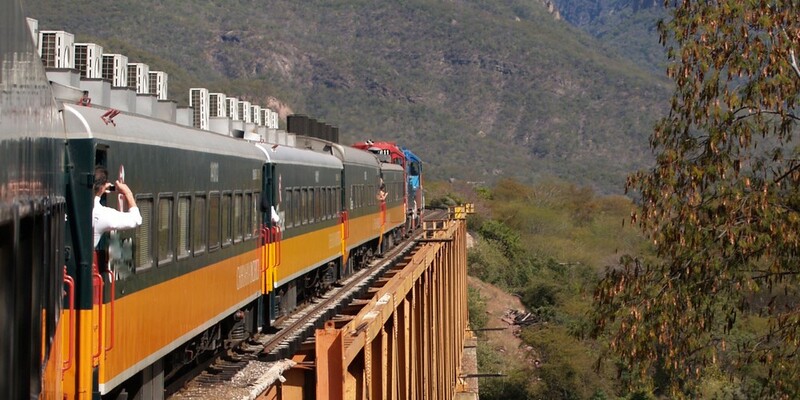 To get to Copper Canyon, take the world-renowned Chihuahua al Pacifico railway, which crosses over 39 bridges, around forests, and through 86 tunnels. Where is it? Northwest Mexico. Fly to Los Mochis airport (check prices). What else should I know? Don’t travel too far off the tourist path in the area, as Copper Canyon borders some higher crime areas in Mexico. Who’s it for? Hikers, train-lovers, nature-fans.